STOP!!!!!!!!!!! Download the Scratch section for this Unit (all 5 projects). Drag and drop the section into your Programming binder. Understand the concepts of sprites and co-ordinates, allowing the player to change the sprite's position upon a keyboard interaction. We need to get Scratchy the Cat moving again. We'll make him dance across the Stage. 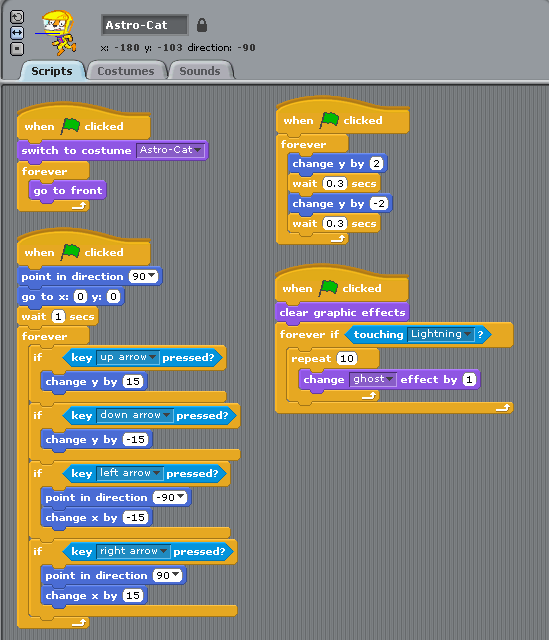 Help Scratchy avoid the lightning bolts to collect seven dimensional strings. Once all are collected, the Monolith will appear! Computer Systems: Types of Software. Click the graphic below to link to the tutorial. Read through all sections on the left-hand nav bar. This will prepare you for the Quiz-Game (next activity). This movie tells you how. Computer Systems: Types of Software. Click the graphic on the left to link to the game. Play as many as you like. Take a screen capture of the results of one game and paste it into the Quiz Game section of your OneNote binder. This movie tells you how.